For me We Are The In Crowd was just a pop rock band with snarky lyrics that would have been perfect for posting as an away message when I was in high school to upset an ex-boyfriend. Only, I’m not in high school anymore. However, with Weird Kids I still conjure up those ironic images, but now there’s a lot more to imagine. Weird Kids holds onto the strong pop rock sound that will help release angst and frustrations, but there’s also a lot of real beauty to this album. There are harmonies and melodies beyond anything I would have expected from WATIC, and the record exhibits hints of what this band will evolve into on their next full-length. A few standout tracks include “Manners” and “Come Back Home.” Both could serve as strong singles, and representations of how this band is expanding on their pop sound. The chorus of “Manners” takes advantage of having two singers in a new way. It’s fun to hear Jordan Eckes serve as a support to Tay Jardine instead of singing with or opposite her. The chorus to “Come Back Home” is a highlight that I can already imagine becoming a crowd favorite at shows. I honestly had the melody stuck in my head for several days. Lyrically the album goes beyond angst and high school heartache. “Don’t Worry” offers comfort and encouragement, while “Windows In Heaven” tackles real tangible loss. The closing track echoes the struggles of finding your own path among the pack; something all their fans can relate to. “I followed the leader / now I just follow myself.” Great advice. This perspective is why I love the strong women of this genre; they help to instill a sense of self-worth in the young audience that looks up to them. With these tracks they have found a way to bridge the gap between their enthusiastic teen audience and a slightly older fan base. Tay’s vocals reach beyond where we have heard her in the past and will change the mind of anyone who was skeptical of her ability to hang with her peers. Tay has truly grown into who she is as an artist and you can hear it in her vocal performance, the album’s beautiful melodies and her matured lyrics. With each listen of the album I found myself finding something new to love. WATIC fans will be thrilled with Weird Kids and pop rock fans will have a new album to crave. 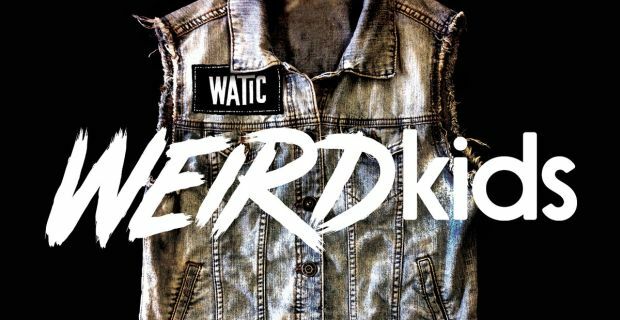 Weird Kids will be available on February 18 via Hopeless Records. They will be touring the US kicking off February 21 and will be playing the Vans Warped Tour all summer. Review written by Sara Scoggins (Follow her on Twitter).